Story - 4: Bizarro is sadly over, and while it was a trying book to get through and critique, it was well worth the effort expended to do so. Bizarro, along with Bat-Mite and Doomed, were books successfully aimed at the audience that DC wants to cultivate, and with precise synchronicity, they are all over. 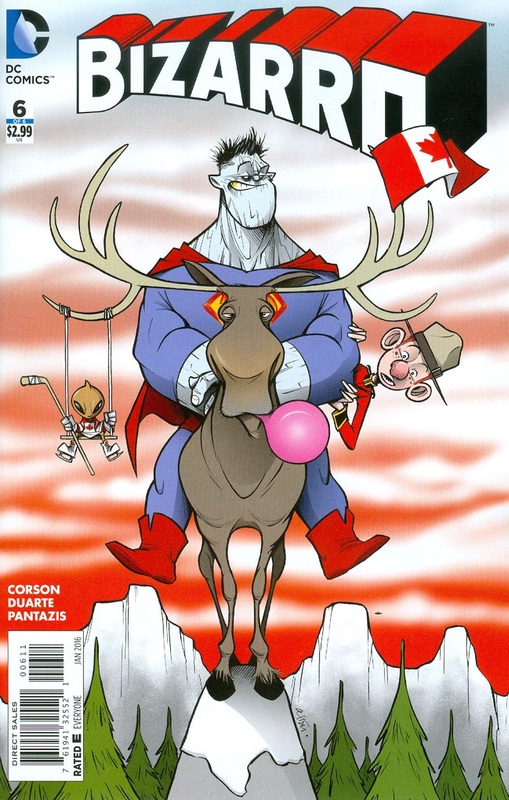 It's doubtful that we'll see the antics of Bizarro again anytime soon, but it's a shame that isn't the definitive case. The book had the freedom (with the exception of the trunks edict) to move easily through the DC Universe, and had more overlay and interplay than many of the titles that DC offers with more prominent characters. It, also, strangely, had a better adherence to continuity despite the elasticity needed to tell the story, when so many comics right now struggle with their own internal sequencing. There's much to be taken from the short-lived series, but the fear is that little or nothing will. The most trying thing about Bizarro, for me, is actually having to read it. Most comics are five panels a page, with a minimum amount of dialogue that you could flip through and be fully imparted. Bizarro forced me to actually maintain back issues, something regular books had not necessitated in years. It's telling when a "lark" book proves more challenging to critique than a mainstay. However, that also made the reading more rewarding: what happened last month, even months before wasn't disposable. That goes a long way towards bringing a reader like myself back, and it's perplexing why so many books offered today, do not tender that same reward for reading. Until next time Bizarro, it's been fun. Art - 4: Sound, but did Tim Sale appear more than one page?! Cover Art - 4: It would have been better if he were riding in the opposite direction.